Donkey Kong the ape has kidnaped Mario's girlfriend! In this action-packed rescue adventure, you move Mariothrough incredible dangers to save her. Your skill and speed determine your score. --From the Atari 2600 Donkey Kong instruction manual. Donkey Kong is one of the cornerstones of arcade history. This game spawned game after game featuring the characters, Donkey Kong, Peach, and, of course, Mario. The port from arcade to Atari on this title wasn't too bad. This game was pretty much the start of it all for Nintendo. The character Mario is now the most popular video game character in the world. Statistics show that in the nineties, more children recognized the character Mario than did Mickey Mouse. The game Super Mario Bros. holds the world record for best selling video game with over 60 million copies sold worldwide. 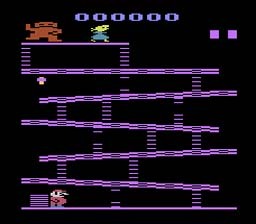 Donkey Kong was definitely a pivotal game for Nintendo and Coleco. If you say you've never played this game, I might say you are a liar. Not really, but you have been living under a rock for a long time, though. On the other hand, maybe you're a young person. Even then I bet you've played Donkey Kong Country or something. If you really never have played this game before, hurry up and hit the launch button and get going. You are Jumpman (who later came to be known as Mario), the mild mannered plumber. Save your girlfriend, Pauline(who later came to be known as Princess Toadstool or Peach) from the tyrannical Donkey Kong. Climb ladders, jump the barrels, or destroy them with a hammer if you're lucky enough to find one. Just get to the top any way you can! Use Arrow keys to move, Ctrl is the Jump button. Remember: Hammers are excellent for killing baddies and obstacles, but you can't jump or climb a ladder while holding one.